Welcome to the Computer Science club Google CS First. 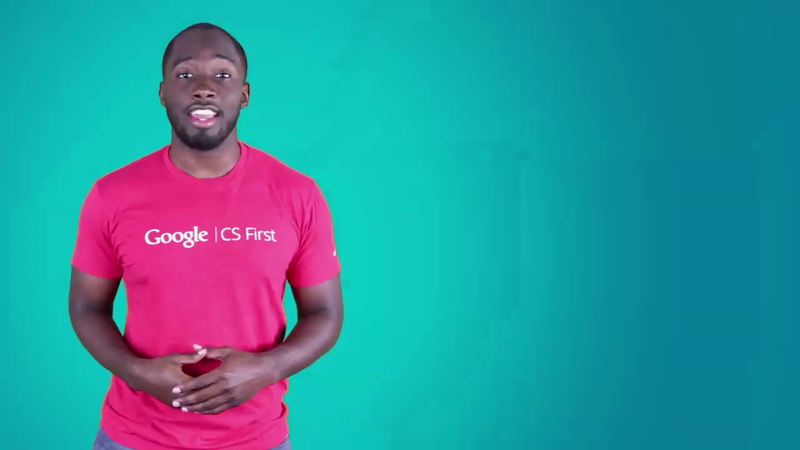 I'm KaMar, in this video, I'll introduce you to the CS First website, and the programming language Scratch, and then, you'll get started on today's activity. In CS First, you'll learn about the many ways Computer Science, or CS, is used. CS borrows from other fields like engineering, psychology, and art to solve problems and creative programs. A computer scientist might work on a challenging problem, like recognizing the objects in an image. Or, take existing solutions and apply them in a creative way, by designing a social media app that filters user's images. By learning Computer Science, you'll gain a skill that can improve the lives of those around you, and you'll begin to understand how computer programs actually work. To create programs in this club, you'll watch videos on the CS First website. For each activity, several videos will guide you through building a project in Scratch. Scratch is a computer programming language. Programming languages are just instructions that tell the computer what to do. You can use the Scratch programming language to build projects, entertain friends, tell stories, and play music. You can even use Scratch to make interactive projects for school. At the start of each club, go to the CS First website, and watch the first video for that activity. It will explain the project that you will build, and provide a few steps to get you started. In most cases, the first video will ask you to open up either a starter project or a new Scratch project. After you watch a video, you complete those steps on your own, in Scratch. Then, click the CS First tab at the top of your browser. And, click the green next arrow to move on. This is the Scratch project editor. It is where you will create or code your projects. This is a sprite, a character or object that you can program. It is located on the stage. This is the block's pallette. It contains blocks or code that you will use to create instructions for your sprite or the stage. To place blocks in your project, click and drag them into the project editor. Click any block to run it, which means to make the computer carry out that block's instructions. For example, when you click the move 10 steps block, the sprite moves forward 10 steps. As you place blocks in your project, snap them together to create a block stack. The computer runs the blocks in the order from top to bottom. Once your computer contains several blocks, either click on the stack to run them or add a block, like 'when Flag clicked', to start the code. Add more programmable sprites to your project by clicking the Choose Sprite From Library button. Each sprite can have it's own code. You can even further customize your sprites using the paint editor. There are additional libraries for backdrops, and sounds. Once you've finished the project, share it with the millions of other Scratch users by clicking Share. Then, anyone who visits your URL can see your project. Now that you have a basic understanding of Scratch, and CS First, it's time to start coding. Click the green arrow below this video to move on.